Driving through Northern Michigan you see stunning water views and wild birds. What I didn't know I would find was the well planned bird sanctuary that is Seney National Wildlife Refuge. From common loon families to osprey and bald eages, this is a place bird watchers will want to visit time and time again. 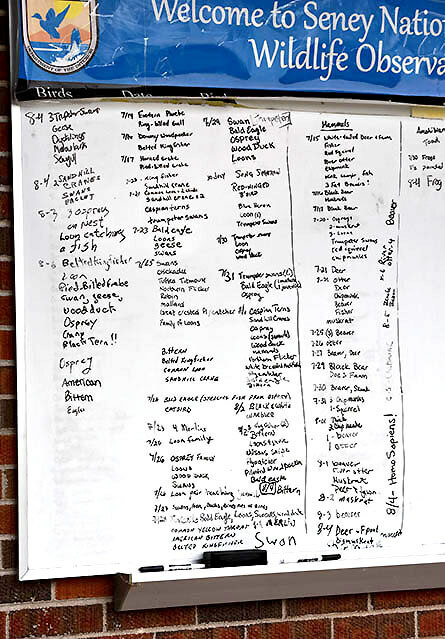 In addition to a list of the birds that are documented daily, mammals and amphibians are also recorded. The diverse ecosystem is home to frogs, otters and black bears (just to name a few). It was worth my time to stop in to learn more about the creatures that live in this beautiful nature preserve. Unlike their name, common loons are anything but common in appearance during mating season. The black and white feathers are striking in both the male and female, while the young are a softer brownish-gray color. 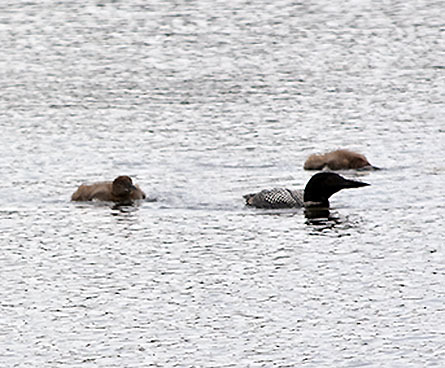 Families of common loons were fairly easy to see on the open water that makes up most of Seney National Wildlife Refuge. 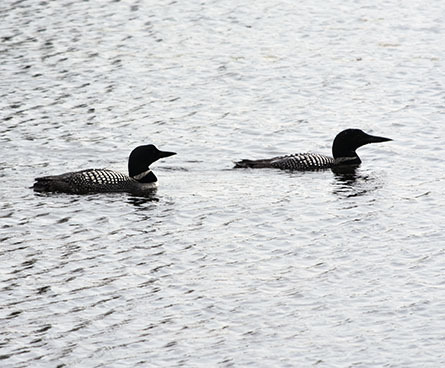 These common loons have an amazing ability to swim under water. An adult would dive for food and appear far away after several moments under the water. If you look closely, you can see the waves made as they swim but if you aren't paying attention, you might miss it. I watched as they dove time and time again, graceful and quiet as they entered the water. When I visited, I found this family of loons busy teaching the young to fish. As I watched the juveniles would, under the supervision of their parents, dive to catch fish. First one and then the other young common loon would dip his head under the water's surface in search of food. In this photo you can see one of the juvenile birds (with the lighter brown coloring) with his head underneath the water. It was as real treat to watch. I once spent hours hiking all over Sauvie Island in Oregon just to get a photo of these majestic birds, only to encounter a pair of sandhill cranes on my first visit to Seney National Wildlife Refuge. At Seney, I was able to observe a pair of sandhill cranes up close (one of the advantages of the space is the viewing platforms and pull outs across the property). 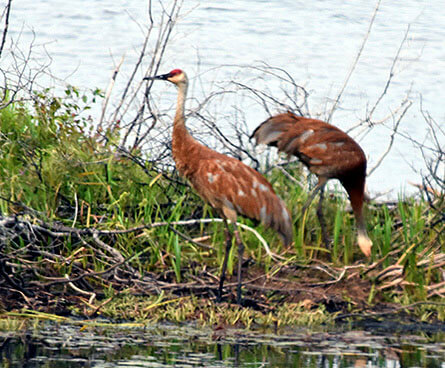 These two sandhill cranes forgaged for seeds and insects in the tall grass before flying off across the water. After watching sandhill cranes at the International Crane Foundation , it's wonderful to experience them again in the wild. There is nothing quite like seeing these unique birds in their natural habitat. The first time I saw a pair of trumpeter swans in Seney I stood very still and just watched in admiration as these beautiful birds moved effortlessly through the water. 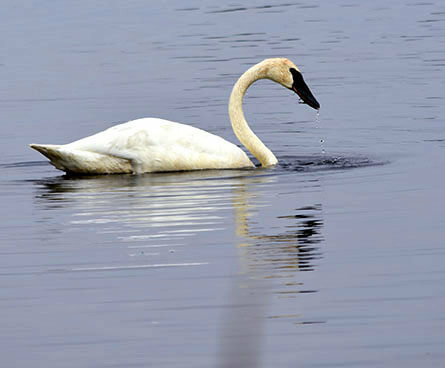 Did you know that the trumpeter swan is the largest water bird in the United States? The bright white colors on the adults make them quite a sight to see in the refuge, and from time to time you will notice them dip their heads into the water to eat some of the vegetation that grows in the shallow water. This solid white bird was once hunted for its stunning white feathers but is now re-established and doing well. 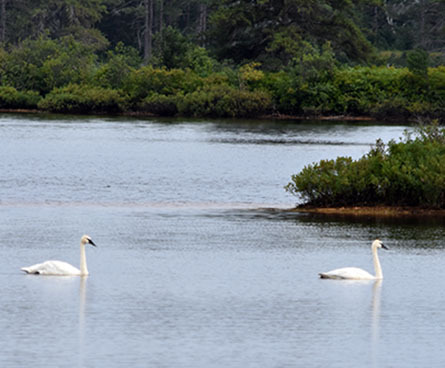 It was quite a treat to see pairs of trumpeter swans around the waterways of Seney National Wildlife Refuge. Osprey are large raptors that feed on fish and nest high up in trees. Fortunately for me and other visitors to Seney, a pair of osprey have made their nest across the water from the observation platform. 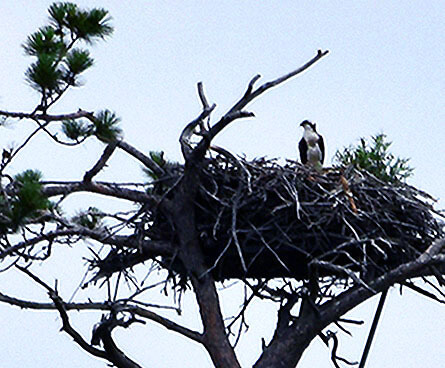 With a good pair of binoculars or a telephoto lense, you can get a clear look at the nest and the osprey roosting there. Those who know me know I have a great appreciation for kingfishers. Since only the belted kingfisher can be found in the United States, I love to observe these regal birds whenever I find one. The belted kingfishers have several traits that make them different from many water birds. From their colors to their nesting habits, belted kingfishers are a great bird to study. 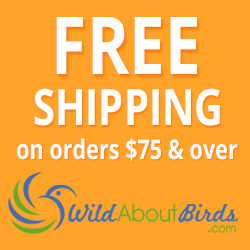 Unlike most birds, the female belted kingfisher is the more colorful of the family. The females have additional bands or blue and brown on their chests, so you have to look closely to see the difference between male and female birds. Kingfishers also make their nests in burrows on a sandy bank. They nest and perch near water for easy access to fish (their favorite meal). If you see dead trees or stumps coming up from the water, it's a good idea to keep an eye out for a belted kingfisher. That's where I found this colorful bird in Seney. 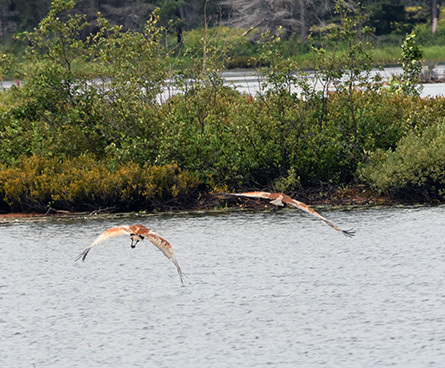 Whether you can spend the entire day on the various hiking, fishing and driving trails or just have an hour or two... the Seney National Wildlife Refuge is a "must-see" for birdwatchers visiting the Upper Peninsula of Michigan. Photo Credit: All photos by WildAboutBirds.com photographer Judy_NMMI. Reference: Alderfer, J. eds. 2006. National Geographic Complete Birds of North America. National Geographic, Washington DC.